Agapanthus plant growing herbaceous geophyte of the genus Agapanthus plant also known as Lily of the Nile, Agapanthus perennial evergreen used as ornamental drought tolerant plant, can grow in subtropics, mediterranean, temperate, desert or tropics climate and growing in hardiness zone 6+. Leaves color green or in variegate can be green with white, the leaves in linear shape and grow in radial growth. 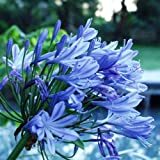 2.5 Quart - Agapanthus Queen Mum - Featuring Extra Large Dual Colored White & Violet Blue Flower Heads & Clumping Strap-like Foliage. 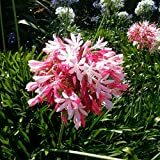 Ideal for Beds, Borders, Pots, Boxes. 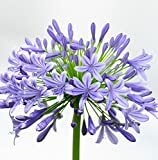 Agapanthus Africanus, Blue Lily of the Nile, LIVE Potted Plant, 10" to 14"
Is it necessary to graft or use vegetative reproduction? 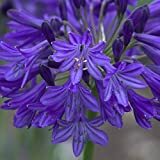 Trumpet shape that grow in umbel structure the color can be: purple, blue or white.